Three people were seriously injured following a four vehicle collision on the A29 Bury Hill, Bury, according to police. Police said the collision happened at about 3.52pm on Sunday (June 24). The road was closed until 9.27pm while emergency services attended the scene, police said. A police spokesman added: “Police are appealing for witnesses following the incident. 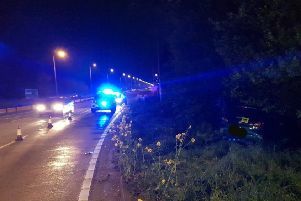 “The vehicles involved were a silver BMW 325 and a silver Vauxhall Zafira, travelling south, and a black Land Rover Discovery and a black Volkswagen Golf, travelling north. Anyone who saw what happened is asked to report it online at https://www.sussex.police.uk/rtcappealresponse or call 101, quoting Operation Holmcroft.